Yesterday was the Passover seder, and we brought nice (button-down) shirts for the boys. 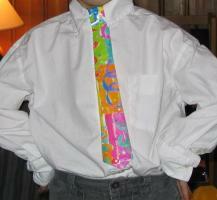 My seven-year-old was unhappy with just the shirt, and wanted a tie to go with it. My father-in-law’s were all too large. What to do? When a child wants to get more dressed up, you want to somehow accommodate them. He didn’t want to wear the shirt in the first place, but seemed to prefer shirt and tie to just shirt. At a quick glance, people asked, “Where’d you get the tie?” He wore it for the whole meal, then as a bonus, got to crumple it up in disgust when we let him change back into a T-shirt. If I ever have to make another, I might try to add a trapezoid “knot” at the top to hide the button and make it look more like a knotted tie, but this one was quite serviceable. I applaud his insistence that if you have to get dressed up, you might as well do it properly. In my job I’m pleased that we don’t generally wear suits, but when we do go to visit clients and therefore suit up, I find myself disliking the current fashion for wearing a suit without a tie. It used to just be while travelling, but now people appear on the news with an open-necked shirt and a suit coat. Where will this degeneracy end? !